When professors criticize one another. In my own odd duck way, I’m enjoying reading two related classics on the economic factors that may or may not have influenced the construction of the U.S. Constitution. Initially intended as a bit of catching up on a famous book neglected only due to life’s other demands, my reading of James Beard’s An Economic Interpretation of the United States Constitution, it soon became clear I’d have to read the comparably famous criticism. 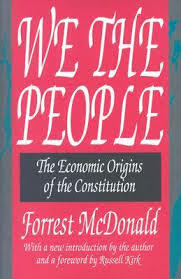 We the People, The Economic Origins of the Constitution. There’s a context to both books that is not to be ignored. Beard’s work was written in 1913, the height of the Progressive Era and the author leaves little doubt of the influence made on the book by that era’s muckrakers. We the People was written in 1958 by Forrest McDonald and stands as the definitive criticism of Beard’s methodology and conclusions. McDonald’s book, written at the height of Cold War reactionism, also leaves little doubt of as to its own influences. I admit to the bad practice of skipping about both books. I’ve read the conclusions of both before reading the building of evidence intended to support each conclusion, but then these texts aren’t mystery novels where reading the final chapter first would ruin all the fun. Both titles are instructive, the first employing the ambiguous article “an” as in An Economic Interpretation, while it’s ’58 criticism uses the unequivocal “the,” as in The Economic Origins. Both writers are true to their approaches, Beard admitting openly that his work is as an approach upon which more scholarship should be built. McDonald’s refutation dismisses and sometimes omits this open position by Beard as the historian shapes a wooden stake with which he pounds through the heart of Beard’s thesis, inviting no criticism of his own pronouncements. Having sneaked a read of each book’s final analysis, I can see why McDonald’s work eclipsed during the past fifty years that of Beard’s. McDonald makes a valid argument that Beard focused too narrowly on only one aspect of the Constitution’s creation, the potential economic benefits to those supporters and creators of the document. 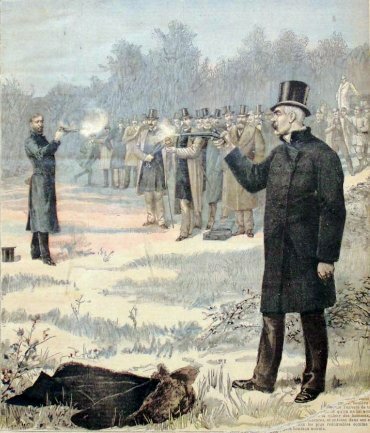 He then goes on to support his criticism by naming not one, but four hypotheses, plus Beard’s, by which to approach a study of the Constitution. In fairness, Beard invited such further examination. original intent recognizes that a “living, breathing document” must be revised at times.” Even McDonald’s interpretation does not leave room for the suggestion that the Constitution was ever intended to produce a stationary government locked in the late 18th century. Ratification alone would have been impossible under such notion. 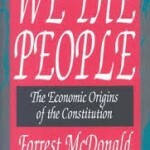 McDonald, who wrote his book more than a decade after Beard’s death, appears to be unfairly dismissing what would certainly have been an unpopular conclusion about the economic interests at play among those who created the Constitution as well as those relatively few who ratified the new form of governance. 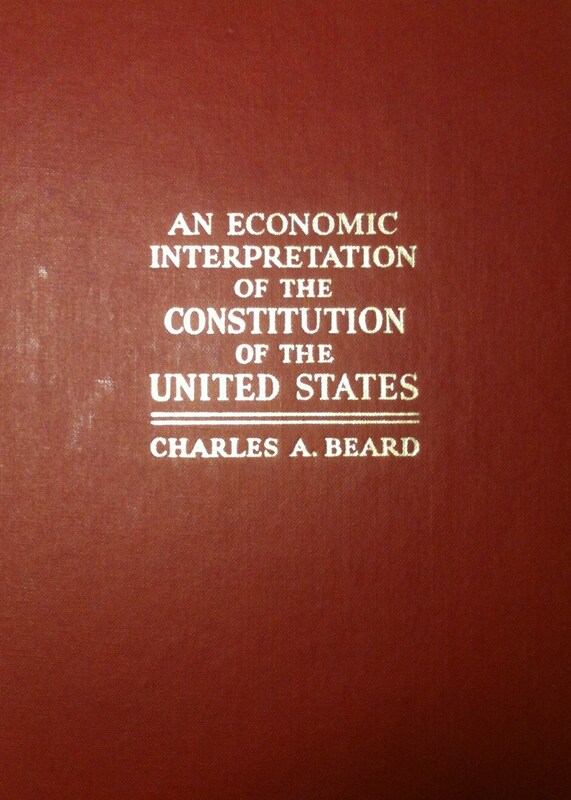 His observations and solid use of primary sources that conclusively refute Beard’s singular interpretation don’t, however, entirely explain away the reality of economic inequality at the time the Constitution was written and later ratified. Again, other factors must be considered to obtain a more accurate interpretation, and McDonald succeeds on this account. However, McDonald goes out of his way to tar his predecessor with contemporary labels and ideologies, such as Marxism, Beard himself denied. 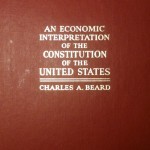 In the end, Beard’s An Economic Interpretation of the United States Constitution stands most prominently as one of the first scholarly attempts to use primary documents to evaluate American History without the mysticism that tended to dominate the study of our past in the 19th century, a practice for which many today advocate with increasing fervor and influence.